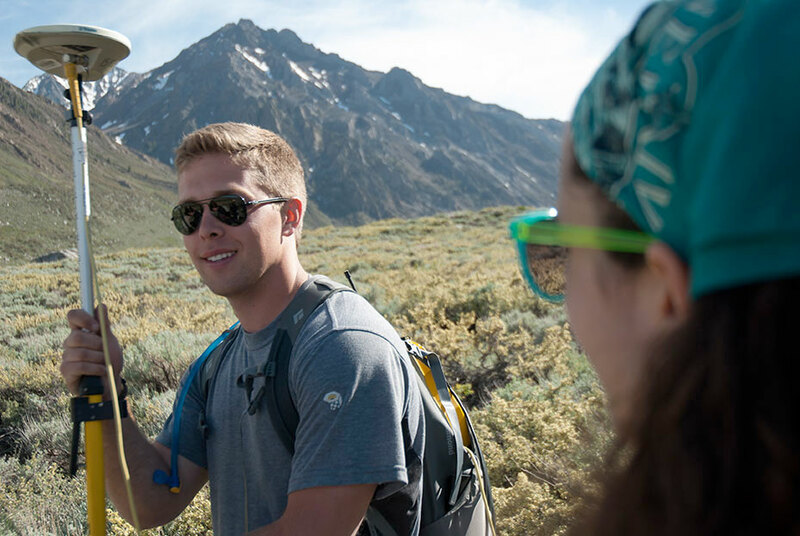 Early every summer, UNAVCO community member Michael Hamburger and co-instructor John Rupp lead a group of college students from Indiana University into what is, for many, their first adventure out west. 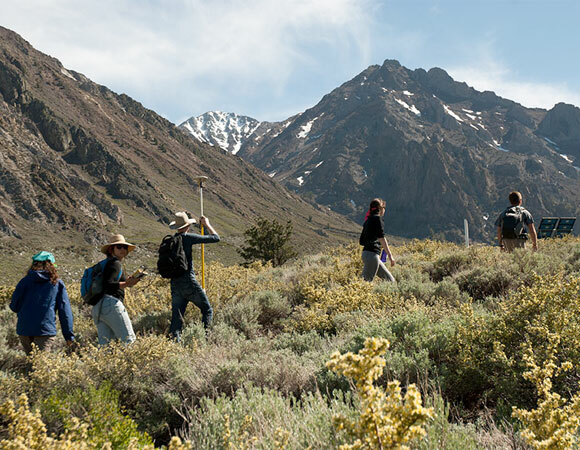 The pair began the two-week introductory course, called Volcanoes of the Eastern Sierra Nevada, over ten years ago, open from the start to students of all majors. This year’s 15 students included majors in geology, environmental science, political science, biology, studio art, Chinese, economics, finance, astrophysics and biochemistry. Although often taken to fulfill a science requirement, the course offers a hands-on experience that is likely to stick with students throughout their careers. 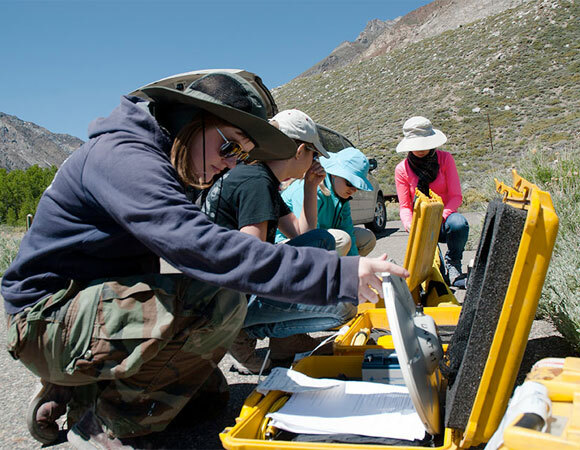 The course takes students through the ecology, hydrology, volcanology and general geology of the Long Valley region, exploring water politics, mining, conservation, and hazards. In the middle of the course, a day spent surveying the Hilton Creek fault scarp in the McGee Creek valley exposes students to various geodetic measuring methods, specifically leveling and GPS. 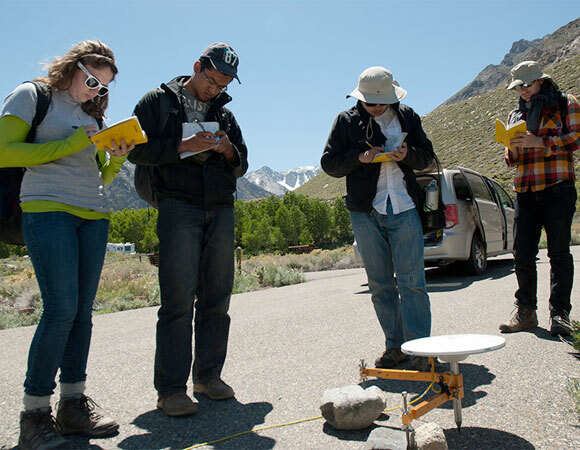 Students learn both how to survey and how surveying helps us to understand natural hazards. The students also hike up to the top of the valley’s terminal moraine to learn to take an approximate strike and dip of the fault trace. The day ends with breaking down the equipment and setting off upvalley for a hike into metasedimentary rocks and wildflowers. Figure 1. 7 Indiana University students get ready to help set up the UNAVCO real-time kinematic GPS system in the McGill Creek Campground. Photo by Beth Bartel. Figure 2. 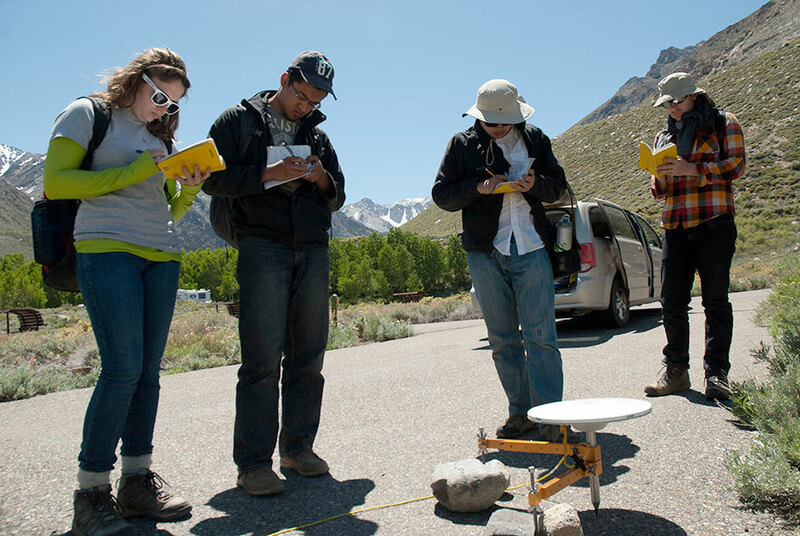 10 Students takes notes around the base station before setting off to measure survey markers established by the U.S.G.S. in 1982. Photo by Beth Bartel. Figure 3. 14 Students work as a team to survey a leveling line across the Hilton Creek fault. Photo by Beth Bartel. Figure 4. 15 Once the survey is started, students teach each other how to use the equipment each time it is handed off to a new group. Photo by Beth Bartel. 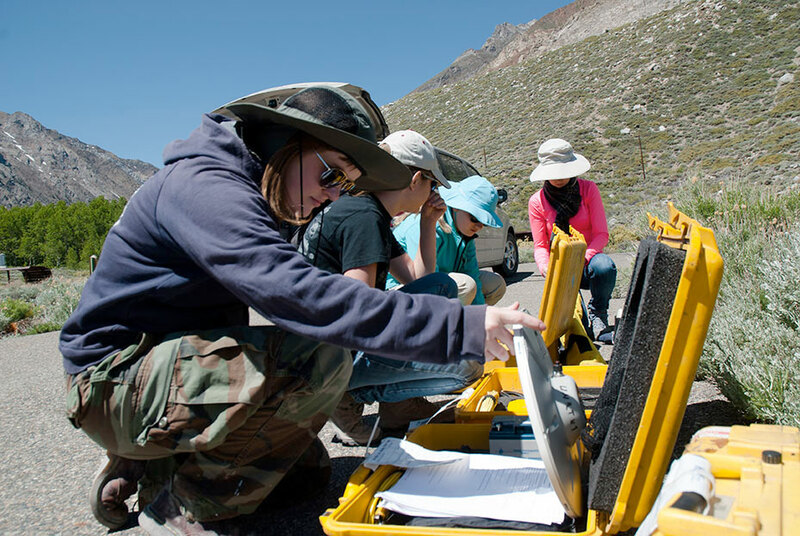 This marks the fifth year that UNAVCO has sent both a real-time-kinematic GPS system and a field engineer to assist with the GPS portion of the Volcanoes of the Eastern Sierra Nevada course. Through an interactive morning lecture, students learned how GPS works, and through an evening slideshow students were exposed to the various applications of GPS and a few anecdotes of what it’s like to be a UNAVCO field engineer. During the field day, students worked in small groups with the field engineer to survey a line of survey markers established by the USGS in 1982. The students helped set up the base station, and then took over--navigating to each point, measuring each point, and documenting the survey in their field books. At the end of the day, the students were able to compare the pros and cons of surveying with GPS versus leveling, explain why GPS measurements are stronger in the horizontal than the vertical, and understand how GPS is used both for navigation and for studying tectonics. It’s not just our next generation of scientists who need exposure to the scientific method and the use of technology in Earth science. 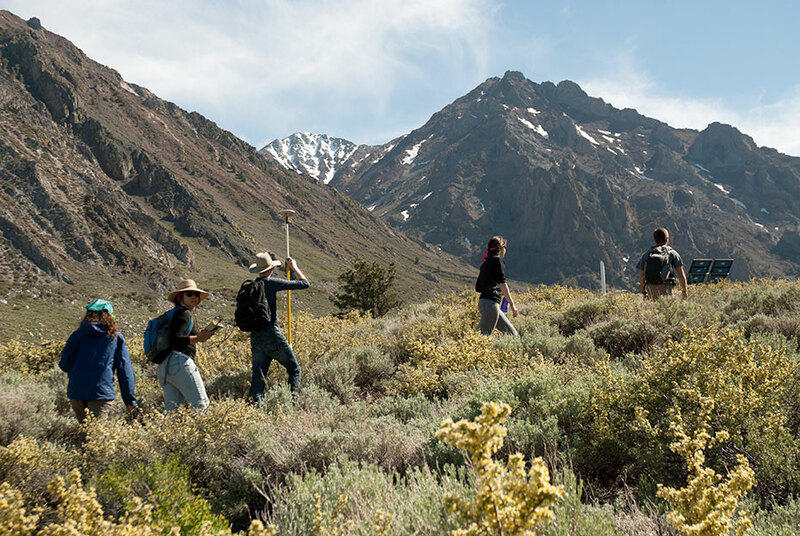 Indiana University’s two-week field course introduces students from a variety of backgrounds, and with a variety of interests, to the complexities of natural hazards and environmental and economic issues in the west. 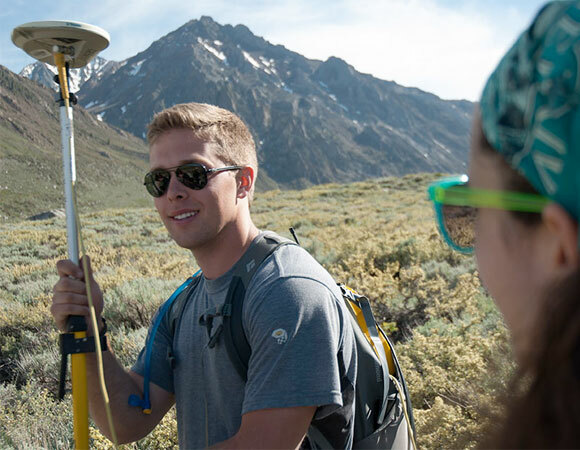 The GPS survey introduces students to instrumented field data collection and to the concept of error sources in data.